AGRI PARTNERS OFFERS MULTIPLE EXCLUSIVE PRODUCTS TO HELP YOU MANAGE YOUR ENTIRE OPERATION. Stick with one company for all your seed needs with alfalfa, fertilizer and chemical from Agri Partners. 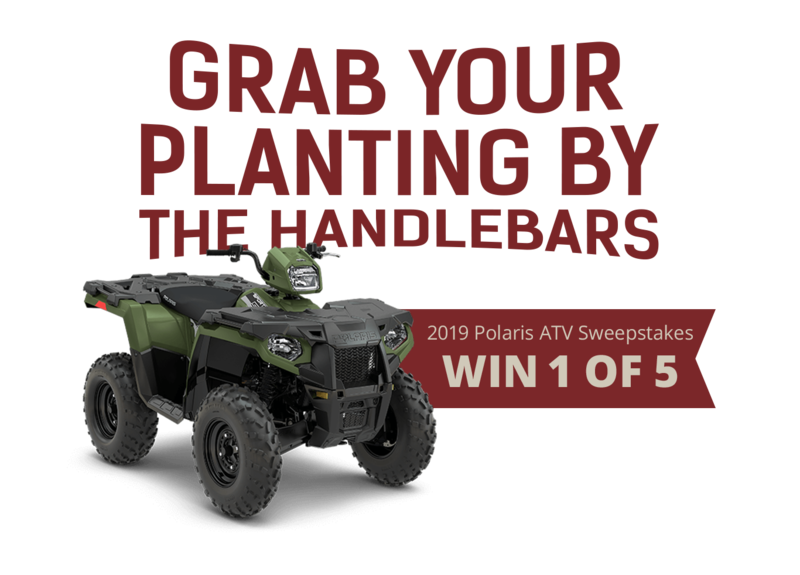 Win ONE of FIVE 2019 Polaris ATVs during our sweepstakes! Winners will be selected August 1, 2019. NO PURCHASE NECESSARY. SOME RESTRICTIONS APPLY. AP SELECT ALFALFA OFFERS THREE QUALITY VARIETIES THAT ARE ADAPTABLE TO A WIDE RANGE OF SOIL TYPES & ENVIRONMENTS. Buy 11 bags of AP Select Alfalfa and get 1 bag FREE! Agri Partners works hard to maximize your yield, that’s why we offer a full line of nutrition products to increase your bottom line. 10-34-0 with 9% Chelated Zinc over a 2 year trial average. *DEADLINE FOR BONUS PLUS & BONUS – 03/15/2019. DEADLINE FOR ALL OTHER PRODUCTS – 08/01/2019. ACHIEVE THE RETURN ON INVESTMENT YOU DESERVE BY PROTECTING YOUR CROP WITH AP CHEMICALS THIS PLANTING SEASON. Win with AP chemicals this season! We will be giving away ONE ATV to a lucky grower in South Dakota and one ONE ATV to a lucky grower in North Dakota! DEADLINE FOR ALL PRODUCTS – 08/01/2019. Sweepstakes Rules and Regulations – No purchase necessary to enter – Selecting a winner will be a random drawing of entry form. To receive an entry form contact Agri Partners at agripartnersinc.com or call 605-874-2550. Information needed to receive a free entry form are name, address and telephone number. Agri Partners will mail you an entry form. Fill out information on the form and mail to: Agri Partners, Inc. 47453 SD Hwy 22. Clear Lake, SD 57226. Any number of free entry forms can be obtained and submitted. Only one entry form per envelope per person. Purchase does not increase the odds of winning. The odds of winning depend upon the number of entries received. 5 Polaris ATV’s will be given away at a retail value of $6,249 each. Winner will be notified by telephone. Agri Partners is the sponsor of this promotion. This promotion is “void where prohibited by law”. Sweepstakes closing date to enter is 8-1-2019. Must be 18 years of age to win.